The Catholic bishops of the United States of America are meeting this week in their annual General Assembly. This year, the bishop are engaging on a wide variety of topics all focusing on the new evangelization. With the election in the past, the bishops now see that a lot has to be done. The United States of America is changing. The new challenges must be met head on. May the Holy Spirit guide our bishops and instill in them the wisdom, knowledge and courage to face the problems of today and tomorrow. 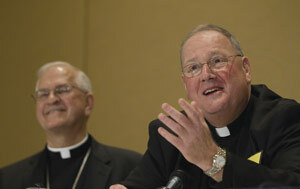 Address given at the USCCB General Assembly Fall meeting on November 12, 2012. Yes, we have "a lot on our plate" as we commence our meeting, urgent issues very worthy of our solicitude as pastors -- the suffering in vast areas not far from here caused by the Hurricane of two weeks ago, the imperative to the New Evangelization, the invitation offered by the Year of Faith, and our continued dialogue, engagement, and prophetic challenge to our culture over urgent issues such as the protection of human life, the defense of marriage, the promotion of human dignity in the lives of the poor, the immigrant, those in danger from war and persecution throughout the world, and our continued efforts to defend our first and most cherished freedom -- all issues calling for our renewed and enthusiastic commitment. But I stand before you this morning to say simply: first things first. We gather as disciples of, as friends of, as believers in Jesus Christ, our Lord and Savior, "the Way, the Truth and the Life," who exhorted us to "seek first the Kingdom of God." The Venerable Servant of God, Fulton J. Sheen, once commented, "The first word of Jesus in the Gospel was 'come'; the last word of Jesus was 'go'." Fifty years ago, on October 11, 1962, Blessed John XXIII courageously convened the Second Vatican Council "the greatest concern of which," he insisted, "is that the sacred deposit of Christian doctrine should be guarded and taught more efficaciously." (Allocution on the occasion of the opening of the Second Vatican Council, Gaudet mater ecclesia). We gather for our plenary assembly in our nation's premiere see, at the close of the XIII Ordinary General Synod of Bishops, still near the beginning of the Year of Faith. Both occasions have the same origin, the same goal expressed by Blessed John XXIII: the effective transmission of the faith for the transformation of the world. But Pope Benedict did not stop with his gracious hospitality. No. He also gave us plenty of fatherly advice -- for our ministry as pastors of the Church and our personal role in the New Evangelization. Here's an especially striking example from his first ad limina address: "Evangelization," the Successor of St. Peter noted, ". . . appears not simply a task to be undertaken ad extra; we ourselves are the first to need re-evangelization. As with all spiritual crises, whether of individuals or communities, we know that the ultimate answer can only be born of a searching, critical and ongoing self-assessment and conversion in the light of Christ's truth." "We, however, should never think that the new evangelization does not concern us as Bishops personally. In these days voices among the Bishops were raised to recall that the Church must first of all heed the Word before she can evangelize the world. The invitation to evangelize becomes a call to conversion." The New Evangelization reminds us that the very agents of evangelization – you and me -- will never achieve that abundant harvest Blessed John XXIII described unless we are willing and eager to first be evangelized themselves. Only those themselves first evangelized can then evangelize. 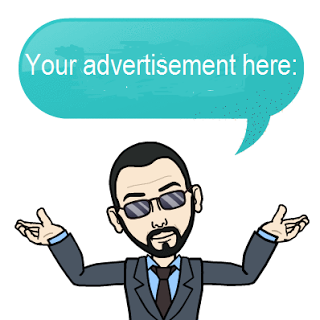 As St. Bernard put it so well, "If you want to be a channel, you must first be a reservoir." I would suggest this morning that this reservoir of our lives and ministry, when it comes especially to the New Evangelization, must first be filled with the spirit of interior conversion born of our own renewal. That's the way we become channels of a truly effective transformation of the world, through our own witness of a penitential heart, and our own full embrace of the Sacrament of Penance. ​To be sure, the sacraments of initiation - - Baptism, Confirmation, the Eucharist - - charge, challenge, and equip the agents of evangelization. Without those sacraments, we remain isolated, unredeemed, timid and unfed. ​But, the Sacrament of Reconciliation evangelizes the evangelizers, as it brings us sacramentally into contact with Jesus, who calls us to conversion of heart, and allows us to answer his invitation to repentance -- a repentance from within that can then transform the world without. ​What an irony that despite the call of the Second Vatican Council for a renewal of the Sacrament of Penance, what we got instead was its near disappearance. ​We became very good in the years following the Council in calling for the reform of structures, systems, institutions, and people other than ourselves.That, too, is important; it can transform our society and world. But did we fail along the way to realize that in no way can the New Evangelization be reduced to a program, a process, or a call to structural reform; that it is first and foremost a deeply personal conversion within? "The Kingdom of God is within," as Jesus taught. ​The premier answer to the question "What's wrong with the world?" "what's wrong with the church?" is not politics, the economy, secularism, sectarianism, globalization or global warming . . .none of these, as significant as they are. As Chesterton wrote, "The answer to the question 'What's wrong with the world?' is just two words:'I am,'"
​I am! Admitting that leads to conversion of heart and repentance, the marrow of the Gospel-invitation. I remember the insightful words of a holy priest well known to many of us from his long apostolate to priests and seminarians in Rome, Monsignor Charles Elmer, wondering aloud from time to time if, following the close of the Council, we had sadly become a Church that forgot how to kneel.If we want the New Evangelization to work, it starts on our knees. 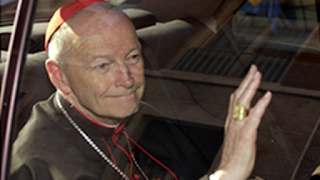 Remember a few years back, when Cardinal Cahal Daly led us in our June retreat? Speaking somberly of the Church in his home country, he observed, "The Church in Ireland is in the dirt on her knees." Then he paused, and concluded, "Maybe that's where the Church is at her best." We kneel in the Sacrament of Penance because we are profoundly sorry for our faults and our sins, serious obstacles to the New Evangelization. But then we stand forgiven, resolute to return to the work entrusted to us - as evangelizers of the Gospel of Mercy. I recall a conversation about a year ago with one of our brother bishops, newly ordained, attending his first plenary assembly. I asked his impressions of the meeting. "Well organized, informative, enjoyable," he replied, but he went on to observe that it was one moment in particular that had the greatest impact on him. It was during our closing Holy Hour, as he entered the large room next to the chapel, to see dozens and dozens of bishops lined up to approach the Sacrament of Penance. This new Bishop told me that he felt that moment had more of an influence upon him than anything else at the meeting. Who can forget the prophetic words of repentance from Blessed John Paul II, during the Great Jubilee, as he expressed contrition – publically and repeatedly - for the sins of the past? He mentioned the shame of the slave trade, the horrors of the holocaust, the death and destruction wrought by the crusades, the injustices of the conquest of the new world, and the violence of religious wars, to name only a few. I remember during the celebration of the 50thInternational Eucharistic Congress in Ireland last June, when Cardinal Marc Ouellet, the Papal Legate, expressed this so forcefully as he spoke on behalf of the Holy Father at the penitential shrine of St. Patrick's Purgatory: "I come here with the specific intention of seeking forgiveness, from God and from the victims, for the grave sin of sexual abuse of children by clerics. . . In the name of the Church, I apologize once again to the victims, some of which I have met here in Lough Derg." And we'll have the opportunity during this meeting to approve a simple pastoral invitation to all our faithful to join us in renewing our appreciation for and use of the Sacrament. We will "Keep the Light On" during the upcoming Advent Season! We work at giving our people good examples of humble, repentant pastors, aware of our own personal and corporate sins, constantly responding to the call of Jesus to interior conversion. Remember the Curé of Ars? When a concerned group of his worried supporters came to him with a stinging protest letter from a number of parishioners, demanding the bishop to remove John Vianney as their curé, claiming he was a sinner, ignorant, and awkward, St. John Vianney took the letter, read it carefully ... and signed the petition! "I feel something touching my spirit that leads to serenity," Good Pope John remarked. "The word of the Gospel is not silent.It resonates from one end of the world to the other, and finds the way of the heart. Dangers and sorrows, human prudence and wisdom, everything needs to dissolve into a song of love, into a renewed invitation, pleading all to desire and wish for the establishment of the Kingdom of Christ. A kingdom of truth and life; a kingdom of holiness and grace; a kingdom of justice, love and peace." We have beheld it in the Church's unrelenting corporal and spiritual works of mercy, in the heroic witness of persecuted Christians, in the Church's defense of unborn human life, the care of our elders and the terminally ill, advocacy for the unemployed, those in poverty, our immigrant brothers and sisters, victims of terror and violence throughout our world, of all faiths and creeds, and in our defense of religious freedom, marriage and family. And, I have suggested today, that as we "come and go" in response to the invitation of Jesus, we begin with the Sacrament of Penance.This is the sacrament of the New Evangelization, for as Pope Benedict reminds us, "We cannot speak about the new evangelization without a sincere desire to conversion." (Homily for the Opening of the XIII Ordinary General Synod of Bishops). With this as my presidential address, I know I risk the criticism. I can hear it now: "With all the controversies and urgent matters for the Church, Dolan spoke of conversion of heart through the Sacrament of Penance. Can you believe it?" To which I reply, "You better believe it!" Thank you for the text of Cardinal Timothy Dolan's speech. The 'take-away' bits for me were his remarks on evangelization and re-evangelization. 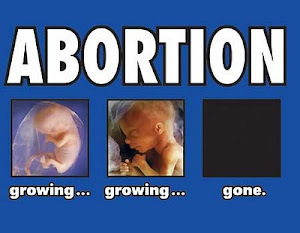 Cardinal Dolan to Obama - HHS NO WAY! Why did Obama win - Romney lose? Is "Sandy" a punishment from God?